With Florida Atlantic entering their third National Signing Day today under Head Coach Lane Kiffin, he met with the media at the close of the afternoon. Below are the highlights of his session. This is by far our best class. Still working now. That is why we are not making a lot of individual comments about guys, because we are still in the process, which I know is probably supposed to be the other way with early signing day for things to kinda be over, but we are still talking to kids. Still trying to finalize things and that may go beyond today. I think the first two (signing classes under Kiffin) as you look back, there was a lot of trying to fill in holes of what we thought we needed from what was here. And now, this is more of what we would sign year in and year out: high school based, a lot of Florida kids, but almost all high school kids to get into our program (and) to develop them. It's very balanced positionally on both sides of the ball, with a lot of really good high school kids that have done great things. 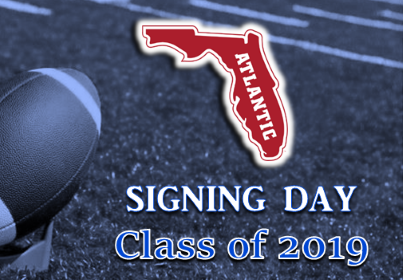 Some are at different positions (than what they will play at FAU), but really good players. I'm really proud of our staff. You have heard me say … when bad things happen they can be really good. That season (2018) not going to a championship, not going to a bowl game was very frustrating at the time, but we were able to spend so much more time recruiting than the year before. The year before, everyone else was out championship week, and we were playing in the championship game. Or we were in a bowl game (2017) it's the day after signing day so we missed days then, not just days out recruiting but evaluating tape, talking to kids and working on our board. This was a much different feel this year, and I think the results show it and they will continue to show it as we finish up this class. Not only today, but back in the early signing period there were a lot of guys from Palm Beach, Broward and Miami-Dade, what went into focusing on those three areas and the Treasure Coast too? That is what it always going to be. Like I have said before, I think the first two years, it takes a while for your assistant coaches to get in their areas and develop relationships in the areas. A lot of times when you sign kids it has taken a couple of years in advance of finding them, of working through the schools, through the areas and figuring out the kids. It think that is why you saw some different areas heavy early on in the first two classes. Some of our guys had more experience in those areas, more relationships. As we continue to grow here, you'll see more and more of this. You signed three junior college so far and it looks like none today. Did you have a feeling when the (2018) season ended or when the season was going on that you wanted to go back to the high school guys and go maybe less away from JUCO? That wasn't a season feel. That was a feel right after we finished the last class. We said ok, now it is time to really get back to the long term of the program, building for the long term. The last thing we wanted to do was worry about next year and the year after that and not worry about the long term of the program. That's when you put programs into trouble, three or four years down the road, when you do that. When you just try to fix everything now and not worry about the long term. We could have went a different route, which may have meant more success next year, but by far this is a better route. This means more success over the next three to four years. With all the work put into recruiting, sometimes it still comes down to today. Coaches were on the phone, you were put on the phone, is that stressful or the nature of the beast? It is what it is. We have some younger coaches. They get a little more nervous. That's just part of it. You are not going to get them all. You are going to lose some. Usually, at the end of the day you kinda have a middle feeling. You basically lost about half of what you thought and got about half. We didn't have that feeling today. We got a lot more than we lost. I was really proud of our coaches working together. You have different coaches that are better at different areas: parents, or kids, or areas of the country. I thought they did a great job through the late hours last night and the early hours this morning of working together and beating a lot of really good schools on really good players. This wasn't just, sign the guys that want to come. There was a lot of work in this. Would you characterize it as not many surprises and if there were they were positive surprises? I think that there weren't a lot of surprises because you usually think they are coming and then they don't. That is a good thing if you don't have a lot of surprises. Some guys changed their minds late. Was there a certain strategy that went into that or just selling them on what you have to offer at FAU? I'm not sure. Kids more now than ever change their mind all the time. It is almost who talks to them last. I guess that's the generation we are going to … They are used to flipping through finding the answer to the next thing all the time. It is what it is and so we looked at it, and (decided) that it is more valuable to visit the kids late. It is more valuable to be the last one on the phone with them. Like I said, our guys did a great job. I'm really proud of them. You mentioned the early signing period and obviously the problems you had in 2017, how did you guys approach it as a staff, not only because you had more time but it was the second year and the experience was still fairly new? I think the first year, we had no idea what we were doing. We were in the bowl game (during) this early signing period, so a lot of people really didn't (know). I think it probably is a good thing. Otherwise everyone is scrambling here at the end, and are kids really committed, or are they not. It (early signing period) does kinda clear that up and allows you to target people and your coaches aren't spread so thin, chasing everybody. I think it is probably a good thing for all levels. I think it helps, but there still seems to be a lot of work to do. We always sided on, let's not try to sign everybody early, maybe reaching on kids. Let's wait and see if we can find better. I think that's why we probably sign as many kids late as anybody. Will there be a few guys that will be in school and eligible for spring practice to compete? There are some kids here already, already working out and in school. That's good to create competition right away. How much does it help to have the early signees here already? It's good. Like I said, from a competition standpoint. (There are) some really good kids. So, good thing. It seemed like a trend with all of these guys down to offensive and defensive lineman is athleticism, basketball players, that kinds of stuff. Was that an intentional target or did that just kind of develop? I think that from the beginning of this class, I have always talked about it, especially this class, let's just find the best players. We don't need to have five at this position, four at this position, three at this position. Instead of reaching, just to get numbers, let's find the best players even if they are not necessarily playing the position that they are going to end up playing. Find really good athletes, guys that make plays on the ball. Guys that are really good players versus guys that should be good players because of their height, weight, speed ratio. Hopefully it works out. The defenders that you got in this class, do you feel that it really hones in on what you want to do in the future on that side of the ball and specifically at DB's and linebackers, were you pleased with what you got? Yeah we are. Still a work in progress. The linebacker numbers had been a little bit down. That was an emphasis starting a year ago, to make sure that we signed some guys there. I think it is a really good defensive class, specifically the linebackers. Have you had a chance, obviously you have been out recruiting, but those four or five guys on campus, have you had time to spend time with them and interact with them? We have been on the road recruiting, until really the last few days. But I have a little bit, actually I was with some of them today. It is good to have them here, those are our junior college guys … It is good to have them here and we will see, throw them in the mix. You really loaded up on running backs. Guys that look like they can be gamebreakers. Can you discuss what you saw in that position group specifically? I think anytime that you have success at a position group, the kids fall within the next one to two years. For "Motor" (Devin Singletary) to do what he did two years ago and then last year and Kerrith (Whyte), this is usually what happens. We had this after Reggie (Bush) and LenDale (White) at USC. It happened at Alabama. When you have a great running back, kids follow that because they see it. I think that was a big deal on this group. I think this it is more of an SEC/ACC-type group, especially when you put BJ Emmons in there. These guys should be really, really good players. It is a really good problem to have that much competition. How much did you guys look at the holes you had and can kids contribute right away? I think that that is where not having a great season can help you. I guess; it was my first time having a losing season in college football. I found the good part of it. That people realize, ok hey I can come, because you guys didn't play as well as you thought. And then losing the two running backs early, obviously people see that. Kids see that as a great opportunity. Did you use Motor, Kerrith and Jovon (Durante) leaving early for the draft to help sway some recruits? You can say, they have guys are playing well, well enough that they can go to the draft and in Azeez's (Al-Shaair) case they can go to the combine? I think kids see that. Hey, here is FAU, which I wouldn't think is used to having three leave early for the draft, let alone on one side of the ball. We get you ready for that level and prepare you for that. Here's three guys and one of the guys was really only with us for one year in Jovon Durante. Come here, have a great year and get you ready for the next level. Have you thought about how many of these guys you can realistically expect to contribute as true freshman or is that something you have to wait and see? We don't really think like that. We plan on all of them playing so that we are always pushing them. Because if you ever talk to kids they will draw down to that, 'Hey, you are going to redshirt.' Then they are not going to work as hard in the offseason. We plan on them all playing and then get them ready to play until they don't. How was the experience of recruiting this year's class different than last year with the more traditional high school athletes and a larger class than previously? Like I said, this is a lot better way to do it obviously. This is the way we will do it going forward. There are specific reasons why we did it the way we did it before. This is what we are more used to where we're at. We have not been transfer or JC-heavy at other places. It was really good to get back to that because you get excited knowing you have kids in that are going to be here for a long time.